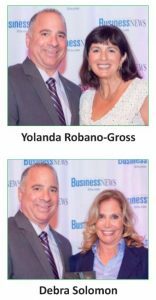 Kudos to Yolanda Robano-Gross and Debra Solomon, who were honored among the Top 50 Businesswomen of the year by Long Island Business News. Yolanda is executive director of Options for Community Living, with more than 20 years of experience within the healthcare industry. Debra founded Spectrum Strategies after serving as a life and career coach for young adults with Asperger’s and other learning differences. Congratulations to these impressive ladies!